Jeckells The Sailmakers proud to be the only supplier of the Sailtainer system in the UK. Sailtainer – the complete mainsail system.Sailtainer is an integrated mainsail system, providing safe and comfortable sailing in any weather. With Sailtainer, it is easy to hoist, furl and reef the mainsail so that it is always set correctly. Sailtainer can be operated from the cockpit.When the mainsail is stowed in the boom it is hoisted with the main halyard. The sail is furled back into the boom with the reefing line. Reefing is just as simple – loosen the halyard and pull the reefing line. The sail is quickly reefed – singled handed. Please note – full battened mainsails are heavier, but careful selection of deck gear will minimize friction. Sailtainer can also be supplied with an electric winch. Sails last longer.Simple operation is not the only advantage of Sailtainer. The sail lasts longer because it is stored inside the boom protected against the sun, salt-water and dirt. The sail is rolled without creasing. Over 1000 boat owners have Sailtainer. No other mainsail or reefing system has as many advantages or is as easy to operate as Sailtainer! It has taken years of close co-operation between sailmakers and boom manufacturers to develop the system. Sailtainer has been tested in every kind of weather and on every type of boat. The Sailtainer-system. Sailtainer is a complete, integrated system, comprising of parts which complement each other and your boat. The Sailtainer system consists of a boom, mast adaptor, kicker and a specially sewn Sailtainer sail. The Boom.The Boom is made of anodised aluminium. It houses the furling axle with the bearings at each end. The furler and reefing line for taking in and reefing the sail are at the aft end of the boom. When the sail is furled, the opening in the boom is covered by the “boom cover”. The boom is available in several sizes suitable for all boats with a mainsail luff of 5 to 24m (P-measurement) There are 2 types of boom: round for up to 13m luff and multi-edged for 14-24m. Mast Adaptor. A mast Adaptor with plastic or aluminium grooves and a top wheel is affixed to to the mast to ensure the necessary space between mast and sail. On boats with a luff of up to 13m, the plastic mast adaptor is fitted straight into the groove on the mast using sliding brackets or a piece of sail. For boats with over 13m luff, an aluminium adaptor rivetted to the mast profile is recommended. Kicking Strap. The Sailtainer adjustable kicking strap ensures the correct angle of the boom into the mast (88-890). The kicking strap is also spring loaded to keep the boom up when the sail is furled in. The Sail. The special Sailtainer sail has full length battens which ensure an optimum sail shape and control the roach perfectly. 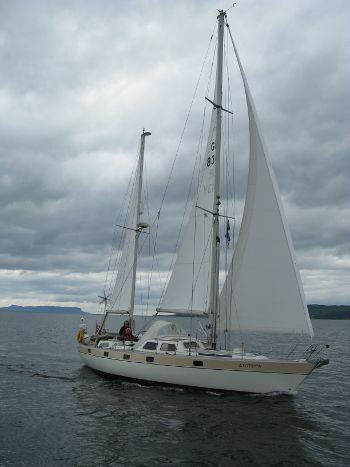 The full length battens keep the sail stretched and the boom halyard is unnecessary – even when reefing. The sail is reinforced around the battens both luff and leech. The special shape and thickness of the reinforcement mean that the sail is perfectly set at every stage of reefing (there is a reefing tie for each batten) and the sail can be unfurled smoothly.